Every 3D Xray is reviewed by the team of Doctors (Dr. Marengo & Dr. Sylvester) to provide the best treatment plan options for our patients. 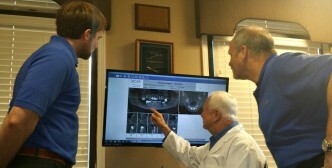 Having two Doctors review each case is another great benefit offered at the Mini Dental Implant Center of Kansas City. We are committed to providing the best treatment plan available with our state of the art equipment and great team of Doctors and staff.